Potatoes are my absolute favorite food. I love them in all their forms: French fries, baked potatoes, scalloped potatoes, roasted potatoes — basically, I love potatoes like Bubba loves shrimp in Forrest Gump. I could eat them everyday and never get tired of them. And nothing says comfort more than a good cheesy potato recipe. Am I right? 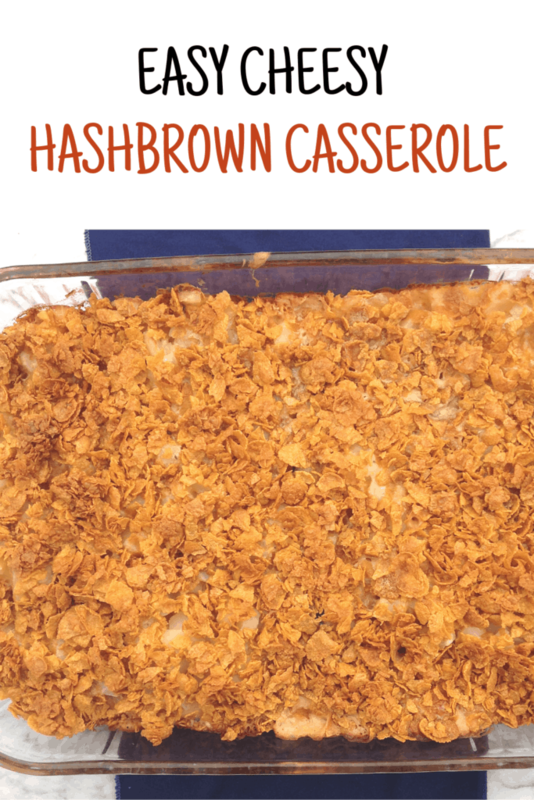 That’s why this Easy Cheesy Hashbrown Casserole with Corn Flakes is one of my favorite ways to eat potatoes. You should make it and see for yourself, especially if you’re looking for a good hashbrown casserole for a crowd. 1. Preheat your oven to 350 degrees Fahrenheit (the official temperature for casseroles — ha!). 2. Mix together shredded cheese, sour cream, soup, and spices. Add the potatoes and stir well. Make sure ALL of your potatoes are well-covered, and then pour the mixture into a greased 9×13 dish. 3. Crush your cornflakes — I do this with my hands, but you could also put them in a Ziploc and crush them with a rolling pin. Mix the crushed cornflakes with the melted butter and sprinkle this on top of the potato mixture. 4. Bake for one hour or until the topping is golden brown and the potatoes are cooked through. To make hashbrown casserole, you’ll need a mixing bowl and a 9×13 baking dish. Make sure the potatoes you buy are the square hashbrowns and not the shredded kind. I’ve used low-fat sour cream with good success in this recipe. 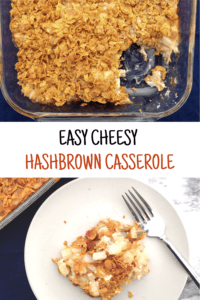 Easy Cheesy Hasqhbrown Casserole is a great side dish with ham or really any meat dish. You can serve it at a brunch or with dinner. If you want to make it a main dish (like the camp I grew up going to did), just add a couple of cups of diced ham. This recipe is easily scaleable and is great for feeding a crowd! Can hashbrown casserole be made in advance? Yes! I’d wait to put the topping on until right before you bake it, though, to avoid soggy corn flakes. This casserole is seriously one of my favorite things in the world to eat. I hope you’ll love it, too. If you try it, let me know in the comments! 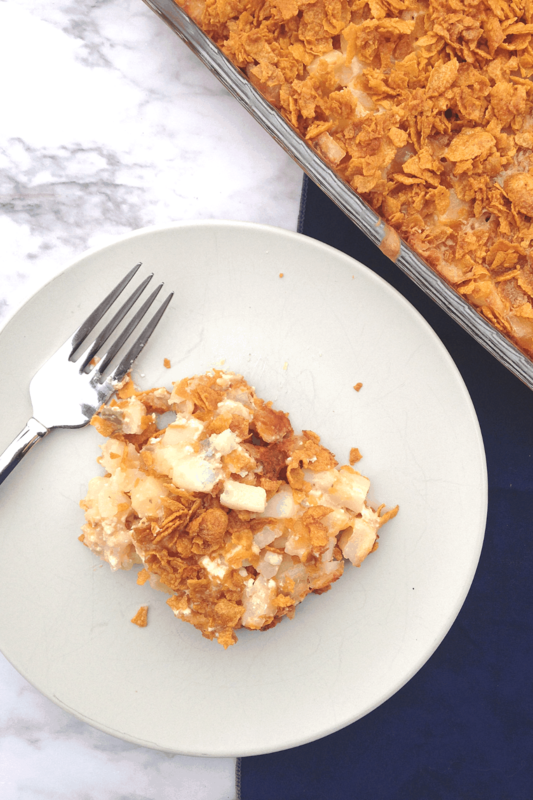 This cheesy casserole with a crunchy cornflake topping is a great side for any meat-focused meal. Serve it with ham, roast beef, or barbecue -- a true crowd-pleaser! Mix together grated cheese, sour cream, cream of mushroom soup, garlic, and salt. Add potatoes and mix well. Place potato mixture in a 9x13 pan. Mix melted butter and crushed cornflakes and sprinkle on top of the casserole as a topping. Bake for 1 hour or until golden brown and potatoes are cooked through.